Developing Artist Original Keyboard Classics. Edited by Nancy Faber and Randall Faber. Faber Piano Adventures. Supplementary, Classical. Softcover Book & CD. 40 pages. Faber Piano Adventures #FF1030. Published by Faber Piano Adventures (HL.420139). ISBN 1616770309. 9x12 inches. Compiled by Faber & Faber. 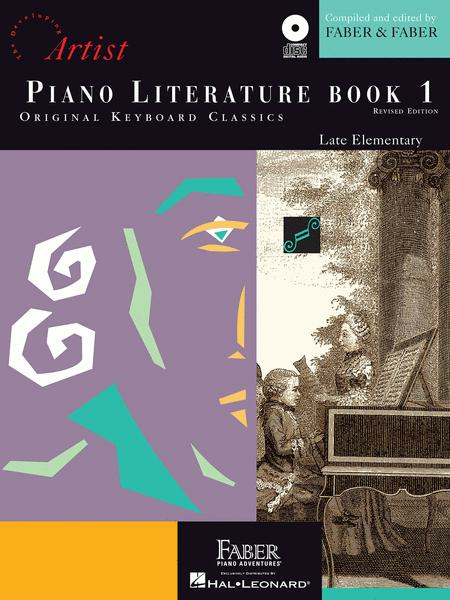 This collection of 21 authentic keyboard works represents the major periods of music - from Baroque to Contemporary - and serves as an excellent introduction to classical keyboard literature. Contents: VON DER HOFE: Canario • PRAETORIUS: Procession in G • TELEMANN: Gavott in C • MOURET: The Highlander • HOOK: Bagatelle • Minuet • TURK: Little Dance • DIABELLI: Morning • HAYDN: Quadrille • ATTWOOD: Sonatina in G • J.C. BACH: Adagio and Allegro • SCHYTTE: Little Prelude • Melody for Left Hand • SPINDLER: Two Preludes • WOHLFAHRT: Waltz for Four Hands • GURLITT: The Hunt • LYNES: Tarantella • ALT: On the Ocean Floor • DUBLIANSKY: The Busy Machine • SALUTRINSKAYA: Shepherd Pipes • FABER: Pantomime. CD is essential to me (a self-taught adult) so i can hear how each song is supposed to sound. the prep book that comes before this one is a good start if these pieces are too difficult for the student. i enjoy listening to the CD from both books. 18 of 29 people found this review helpful. the Preparatory Piano Literature book also with FJH before this one. 39 of 59 people found this review helpful.